After a superlative December – which brought wins over current County Champion Liam Gutcher and world No 314 Phil Nightingale in the Gosforth Classic pro tournament – Forster was not the darkest of horses.The pedigree was certainly there, but such had been the speed of Forster’s development in the senior game, it still felt like something of a shock when he toppled County No 1 Gutcher 3-1 for the second time in as many months, this time taking the Northern No 1’s prized county title into the bargain. Forster had seen off men’s county players Cai Younger and Dave Barnett on his way to the final. The crowds are used to seeing energy and amazing retrieval from junior players; but Forster showed a superb temperament too, staying patient in the long grinding rallies in both matches and keeping a cool, consistent approach. His long-term coach Barnett – who himself had relinquished a 13-year hold on the men’s event only last year – still had high hopes of climbing back onto the podium. And he came within a shot of the final at 2-1 and match ball up. It wasn’t to be; the pupil persevered to level the match and Forster’s energy proved the difference in the fifth. Surely Liam Gutcher – full-time squash coach and a fitness fanatic whose standards barely waiver – would have too much big-game experience in the final. So the arguments went, and there was logic in it – but someone forgot to explain the finer details to Forster, who looked happy and relaxed before, during and after a convincing 3-1 win – 12-10, 11-6, 6-11, 11-6. Northern’s Gutcher did precious little wrong, and that he managed to grind out the third game against a player in imperious form was testament to his guile as much as his ability. An immaculate performance, then, from the young pretender – and the person who looked least ruffled about the whole thing was Forster himself. The ladies final proved to be an altogether grittier affair – perennial rivals Hannah Cliff and Sam Ward were locking horns again, with the tie given added spice by the latter’s switch from Tynemouth (Hannah’s club) to play for Northern this season. This was a real clash of styles with the nimble Cliff playing a quiet, athletic game, moving fast and skipping round her opponent. Ward, gunning for her fifth county title, was the more aggressive of the two, getting on the front foot, taking the ball early, going for the kills and dominating the T. Cliff – herself a former champion in 2016 – looked on form, timing her strokes well. She was went one game up (11-9) then had two games balls in the second. But she couldn’t take her chance, and the moment passed. It felt crucial at the time, and so it proved. Ward was hungry, and determined throughout. She took that pivotal second game 12-10 after winning a few close let appeals; and she didn’t look back. 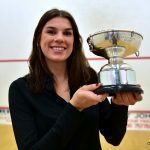 Cliff still had her moments, but Ward’s hard-hitting accurate game saw her home in two more close affairs (both 11-9) for a hard-fought 3-1 win which was much closer than the scoreline suggests. 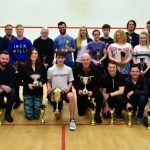 There were another NINETEEN finals played in a veritable squash bonanza at Tynemouth Squash Club, held over a week of intense competition and timed in early January to get the blood pumping again and clear out those festive cobwebs. 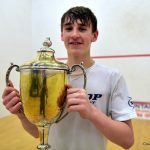 Tynemouth’s Richard Bradley took the B Event with a 3-1 win over Newbiggin’s fast-improving Simon Broatch, while Ben Brown of Primrose proved too strong for Northern junior Kieran Mahoney in the C Event. Shaun Hood recovered from match ball down to take the D Event final 3-2 over Newbiggin’s Phil Dobinson, who lost 12-10 in the clincher after a battling performance. 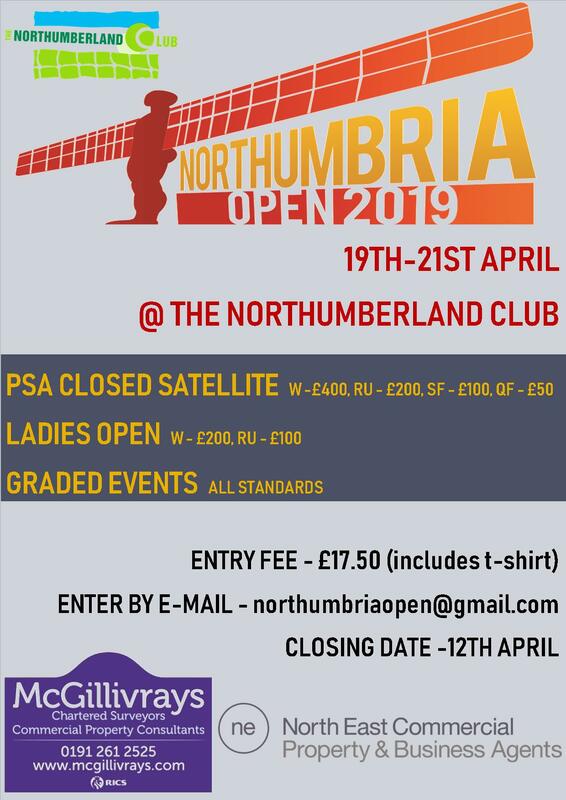 Northern’s Tom Cornell looked in top form as he retained his racketball title with a 3-1 victory over John Armstrong (Newbiggin), while Sunderland pair Peter McCleod and Simon Cliff edged out Cornell and his clubmate Andrew Shipley in an entertaining and energetic doubles final. Tynemouth’s evergreen club champion Jon Evans had his usual busy week – he reached the quarter-finals of the A Event, then took the Over 45s (3-0 over Peter McCleod) and the Over 55s (3-0 against clubmate Paul Millington). Newbiggin’s Ron Freeman edged out Tynemouth’s Colin McNestrie 3-2 in a Men’s Over 60s final full of crafty angled shots – a lifetime of squash-playing tricks coming to the fore – while the Ladies Over 40s was an all-Tynemouth affair, with Louise Robertson’s energetic game proving too much on the day for Nicky Dobson (3-1). Thanks go out to tournament organiser Eric Mok, who did a fantastic job smoothly organising so many different events – and who managed to find time to win the B Event Plate into the bargain. 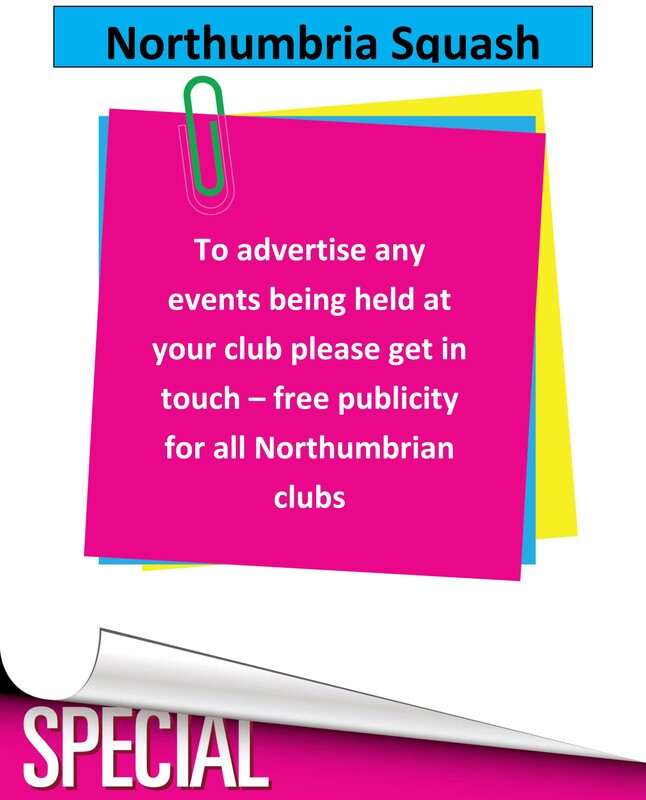 Thanks also to Tynemouth’s Steve Cubbins for live video footage throughout on the County website, and daily updates. And well done to all the Plate winners: Peter McCleod (Sunderland), Fiona MacFarlane (Tynemouth) – who won the Ladies Plate final AND the C Plate final – Tony Hedley (Concordia), Gary Clark (Dunston), Mike Cherryman (Consett), Sarah Bedford (Jesmond), Steve Cubbins (Tynemouth), and Adam Coates (Eldon Square).